With so many larger than life superheroes mashing together in one movie, it would be a difficult job for any director to contain all these egos and give each lead character their own moment and opportunity to shine, enter Joss Whedon comes in. The man who can take many characters and make them all relevant pieces in the puzzle that is the Marvel Cinematic Universe, and through excellent writing and remarkable performances from all the ensemble cast, every member of the team shines. With each scene, each character takes their turn, be it a scene with Black Widow or a scene in which Tony Stark and Steve Rodgers are clashing (cue massive Civil War excitement.) Each character gets their moment to shine individually and when they come together as a team, except it’s not sunshine and sweeties when they immediately meet. There’s bickering, squabbling and in fighting Of course, bringing all these larger than life characters in one room, odds are that they will not get along immediately. In fact they will bicker and squabble till the cows come home, or until a significant event draws them all together and they have to team up to save humanity. The final showdown in New York City provides some of the sweetest action scenes we have seen in the MCU to this day. It’s glorious to watch the team tackle Loki and his army of the Chitauri, who are unfortunately rather forgettable and almost weedy, as the challenge they pose to the Avengers is somewhat weak. There is a lot of destruction mind you, but not quite on the same level as a Bayhem sort of destruction like we have seen in the Transformers franchise. Throughout the battle there are some glorious comedy moments that will provide the audience with some chortling moments in between some great action scenes. It all built up to this and it did not disappoint. Paving the way for more brilliant movies of phase 2 of the MCU that will lead to sequel that has every potential to be another explosive thrill ride. The bar has been raised very high and with Whedon again in the director’s chair for the upcoming sequel, the bar could very well be hulk smashed once again. 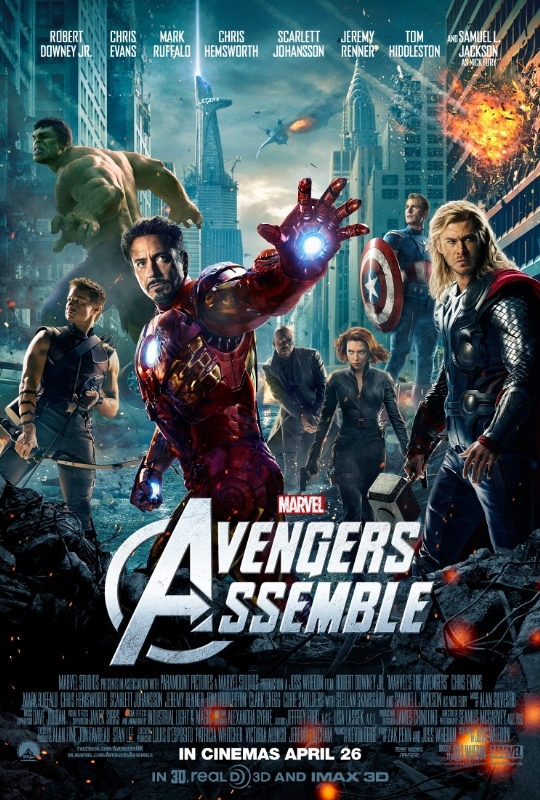 Humorous, entertaining, with a strong script, a terrific ensemble and some stellar direction from Whedon, this ensemble meeting raised the platform of the superhero genre, and it raised it to some very high standards. The sequel has some big shoes to fill. I need to rewatch this before next week. Good post man. Wow! Thank you for the nomination dude! I’ll get to work on that post over the weekend! and yeah I rewatched it last night before AOU tonight! Excited!